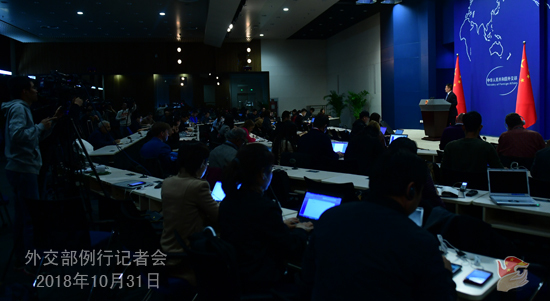 Q: China will assume the rotating presidency of the United Nations Security Council in November. How is China going to perform its duty and play its role? What will be China's priorities? A: Starting from tomorrow, China will officially take over the rotating presidency of the United Nations Security Council for November. According to the information I have now, the Security Council will hold deliberations in November on situations in Syria, Libya, Iraq, Lebanon, the Middle East, Bosnia and Herzegovina and the Sahel region. China, as the rotating president, is also considering holding open sessions on strengthening multilateralism and the role of the United Nations against the background of the current situation and on the issue of peace and security in Africa. We are in consultations with other members of the Security Council on the working plan for November. The UN Security Council stands at the core of the collective security mechanism established after the Second World War and offers an important platform for global security governance. At present, international peace and security is confronted with complex challenges. As the rotating president of the UN Security Council for November, China will work to ensure that the Security Council will uphold the purposes and principles of the UN Charter, act in an objective and fair manner, maintain solidarity and cooperation, and take effective actions to actively promote the political settlement process of regional hot-spot issues, thus fulfilling its important role in upholding international peace and security. As the rotating president of the UN Security Council, we will also step up interactions with non-Security Council members, in particular parties involved in the matters on the Security Council's agenda, and fulfill our mandate as the president of the Security Council in a more open and transparent manner. Q: Can you tell us how much money the Chinese government has given Papua New Guinea to help prepare for the APEC meetings next month? There has been some criticism saying that the money might be better spent on more pressing issues like addressing poverty and disease issues in Papua New Guinea. Secondly, can you give us some details about the meetings that China is going to have with Pacific Island leaders? A: On your first question, the Chinese government has long been offering sincere help to the Pacific Island countries including Papua New Guinea under the framework of South-South Cooperation, which has strongly boosted the region's economic and social development, including enhancing their self-reliant development capacity and addressing poverty and other livelihood issues like you mentioned in your question. When extending our help, we follow the principle of non-interference in other countries' internal affairs while fully respecting the will of the governments and peoples of the Pacific Island countries. We attach no political strings and never impose our own will on others. This year will be the first time for Papua New Guinea to host the APEC meetings. Papua New Guinea wants to contribute to strengthening the region's multilateralism process and economic integration. All parties should show more encouragement and support to that aspiration. In response to the requests from Papua New Guinea, China has been actively supporting and helping Papua New Guinea in hosting the APEC meetings, which was warmly welcomed by its government and people. As for your second question, China attaches high importance to developing its relations with the Pacific Island countries, and stands ready to work with the Pacific Island countries to enhance exchanges at the top level and other levels, deepen practical cooperation, strengthen communication and coordination on international and regional affairs, and continuously move forward the strategic partnership between China and the Pacific Island countries. At present, China is in communication with relevant countries on the specific matters of our meetings. Q: According to reports, Taiwan's so-called "deputy defense minister" traveled this late October to Maryland, the US to attend the US-Taiwan Defense Industry Conference. Officials from the US Department of Defense also attended and spoke at the conference. What's your comment? A: China is firmly opposed to any forms of official exchanges and military contacts between the US and Taiwan. This stance remains consistent and clear. 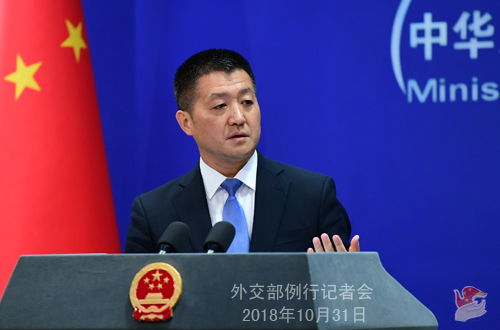 We urge the US side to abide by the one-China principle and the three China-US joint communiques, stop its official exchanges and military contacts with Taiwan, and stop selling arms to Taiwan. We hope that the US could prudently handle Taiwan-related issues so as to avoid any harm to China-US relations and cross-straits peace and stability. Q: President Salvador Sánchez Cerén of the Republic of El Salvador arrived in China today. Could you give us some details on his meetings today? A: I have talked about his visit before. At the invitation of President Xi Jinping, President Salvador Sánchez Cerén of the Republic of El Salvador is on a state visit to China. According to what I have at hand at the moment, President Xi Jinping will hold talks with President Sánchez. Premier Li Keqiang and Chairman Li Zhanshu of the NPC Standing Committee will meet with him separately. Besides Beijing, President Sánchez will also travel to Shanghai to attend the first China International Import Expo. Although it has been just two months since the establishment of diplomatic ties between China and El Salvador, bilateral exchanges and cooperation have been rolling out rapidly in various areas and bilateral relations have been developing steadily. China welcomes President Sánchez's visit and hopes to work with El Salvador to ensure a fast growth of bilateral friendly exchanges and cooperation and deliver more benefits to the two peoples. Q: Do you have any comments on the US Cornell University's decision to stop its exchange programs with the Renmin University? A: First of all, we need to check whether this is a decision made by the Cornell University or a piece of advice from one of its deans or project managers, and I would like to refer you to the competent authority, the Ministry of Education in this case, for more information. 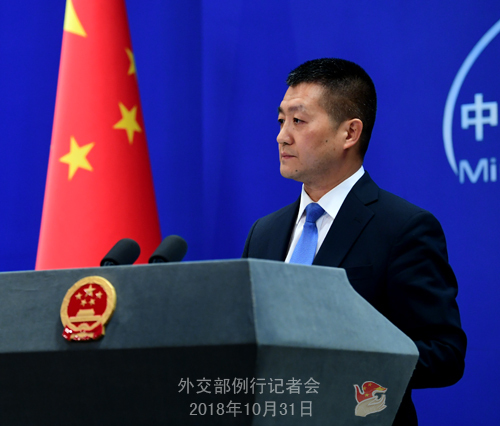 As a principle, I want to point out that people-to-people exchanges between China and the US have been serving as a sound basis for the two peoples to enhance mutual understanding and ensure the steady development of bilateral relations. Today, an average of 15,000 to 16,000 trips are made between China and the US across the Pacific Ocean every day. Such ties will not be severed just because someone wants to do so. The American people want to preserve and improve such exchanges with China. We hope the US side could acknowledge its people's wish and refrain from going against the trend of history. Q: The United States Department of Justice has charged Chinese intelligence officials with trying to hack into private companies' computers to steal information on aircraft jet engines. Are you aware of this case and has the Chinese side discussed it with the US? A: The relevant charges are sheer fiction and totally fabricated. Q: According to reports, the Trans-Pacific Partnership (TPP) will come into force on December 30 as six countries have ratified the deal. What's your comment? A: I believe the TPP is now replaced by the CPTPP. Though not a party to the CPTPP, we hold a consistent and clear position on that issue. We will adopt an open and positive attitude towards all regional free trade arrangements that are conducive to upholding the core values and basic principles of the World Trade Organization and promoting regional economic integration. Q: Pakistani Prime Minister Imran Khan will visit China starting from November 2. Pakistani officials once said that the CPEC projects need to be reviewed because of the high costs of borrowing. Do you think that Prime Minister Imran Khan is likely to discuss the financing of the CPEC projects when he is here and will the two sides discuss additional funding from China or the IMF bailouts to Pakistan? A: I have talked about Prime Minister Imran Khan's upcoming official visit and his attendance at the first China International Import Expo in Shanghai. This is Prime Minister Imran Khan's first official visit to China after he took office. Both China and Pakistan attach great importance to this visit and we believe the leaders of the two countries will have an in-depth discussion on issues of mutual interest. With the concerted efforts of the two sides, this visit will surely inject a strong boost to China-Pakistan relations. China and Pakistan are all-weather strategic cooperative partners, and our bilateral relations will not be affected by any changes in the international and domestic landscapes. Regarding the issue of the CPEC, I have taken similar questions here for many times. The Pakistani government and all sectors of its society have made it clear that the CPEC is a cooperation project for mutual benefit and plays an important role in improving people's livelihood and driving Pakistan's economic development. The assertion that the CPEC is causing financial and debt problems for Pakistan has been stirred up by some people every now and then. But the Pakistani side already made it clear that debts incurred by the CPEC only account for a very small portion of Pakistan's total debts and it is not a reason why Pakistan is experiencing financial difficulties. If the two sides talk about the CPEC during Prime Minister Imran Khan's visit, it will be about how the two sides will work together to firmly advance the CPEC.